Keeping children in shoes is especially important in developing nations, but the cost of keeping up with kids' growing feet makes it a challenge for many families. 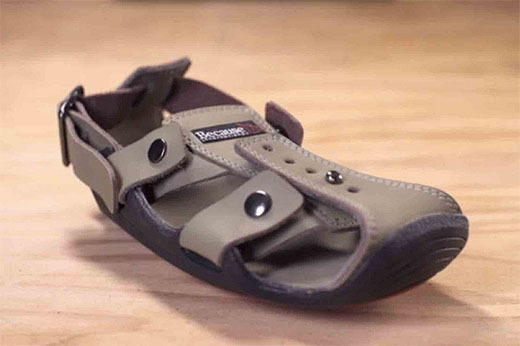 The Shoe That Grows is designed to address that, by adjusting its size along with a child's feet from age 1 to 5. It's durable (lasting 5 years) and low-cost (reportedly down to $10 per pair) - and the design of how it adjusts to foot size is downright brilliant. Here's hoping this design can follow through with the impact it seems capable of! 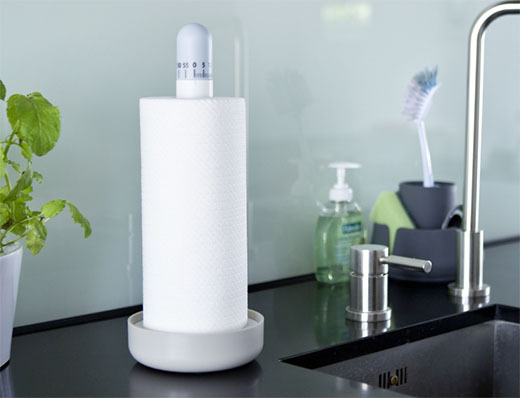 If you appreciate efficiency, simplicity, and overall cleverness, here's a treat: the Towel Timer is a one-handed mechanical kitchen timer that discreetly sits atop a paper towel holder. I love the fact that it occupies a previously unused space which happens to be easily accessible and visible - perfectly suited for its function. Add to that the satisfaction of simply turning a mechanical timer, instead of pressing beeping membrane buttons on a microwave timer, and it's a real delight!